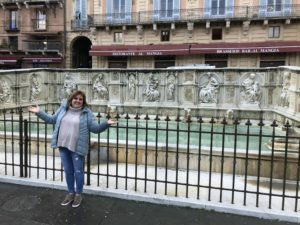 A few weeks ago my husband and I traveled with some dear friends to Italy. We so enjoyed seeing more of this beautiful country and spending sweet time with our friends. One of the jokes of the trip was that my husband Bill continuously read facts and tidbits about the place we were visiting out of his trusty guide book. You should know he LOVES a good guide book. He purchased the book for this trip almost eight months before we left and began reading/studying it right away. As much as we poked fun at his undying love for the guide book, he actually did show us some really cool things we might not have otherwise seen. He always seemed to have a fun, unusual or trivial fact to share. On the day we visited Siena, Italy we walked straight into the town’s piazza and began taking pictures. The first site we came to was the “Fountain of Joy”. After a few pictures here we moved on. When we returned home and I downloaded the pictures I noticed something about the Fountain of Joy that I hadn’t noticed before … I knew it had a fence around it but I hadn’t seen the padlock on the gate. Click below to view “Five Seconds of Scripture” (March) … and how anyone can unlock the gate to the fountain of joy in their lives. Looking forward to Joy full moments with you. Congratulations! Praying for you in your newest endeavor, and that your word is received and revealed to my heart and others who want to learn more about the word of God.